FROM a pressure of five pounds a square inch to five hundred pounds - that epitomizes the story of the marine steam boiler during more than a century. With the steady improvements made in the steam engine, the boiler has played its part in supplying the source of motive power in volume and pressures that have steadily increased with the years of progress in marine engineering. With the adaptation for the requirements of ship propulsion of the steam engine as used on land, the earliest boilers also followed “land” practice. They were generally of the round-topped “wagon” type introduced by the famous James Watt in 1780. Such boilers were intended for use with steam engines worked by atmospheric pressure. They therefore carried only five or six pounds of steam to the square inch. They were only strong enough to carry the weight of the water they contained and were externally fired. The flues were of brick and sometimes a brick funnel was used such as that in Baird’s steamer, illustrated on page 299. ONE OF THE TUBULAR BOILERS fitted in H.M.S. Janus in 1844, at the suggestion of Thomas Cochrane, tenth Earl of Dundonald. Four boilers were used in H.M.S. Janus, and the model illustrated shows one of them in section with its three furnaces opening into a common combustion chamber at the back of the boiler. The land boiler was soon improved by the use of internal furnace flues, and its application to marine purposes produced the well-known “box” boiler that served the marine engine from about 1820 to the middle of the nineteenth century. 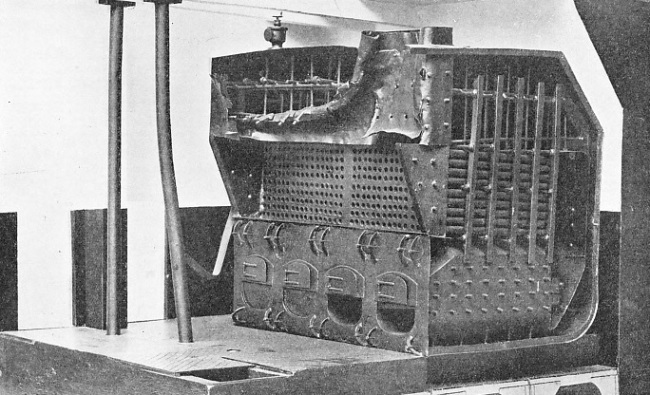 The box boiler, as its name suggests, was of rectangular shape, suited to the limitations of space on board ship. Boilers of this type were really large tanks often containing many tons of water but generating steam at only a few pounds above atmospheric pressure. For their contemporary marine engines, however, they were suited admirably and gave good evaporative results. The heating surface was obtained by the provision of large internal flat-sided flues - tunnels in which a man could easily stand upright. Such flues were generally about 7 feet high and 18-in wide, and were completely surrounded by water. The water space between adjacent flues was about 6-in wide and the flat surfaces were all tied together by stay-bolts to prevent their collapse under the weight of water and steam pressure. Boilers of the box and similar rectangular types usually had two sets of safety valves - those opening outwards to permit the release of excess steam pressure, and those that opened inwards to let in air. On cooling down after the withdrawal of fires the steam in a boiler condenses, leaving a partial vacuum above the water. The early flat-sided boilers were provided with these “internal” safety valves to enable the vacuum to be destroyed without danger. Other-wise there would have been a risk that atmospheric pressure (about 15 lb a square inch) over a large area would crush in the iron plating. A notable feature of these early box boilers, and one that contributed materially to their success, was the use of copper for their construction, especially in those built for use in warships. Among other boilers introduced in this early period was the “haystack” type adapted to marine requirements by David Napier in 1842. Napier’s boilers were fitted in a number of early Clyde steamers and were extensively used in small steamships. The next important development in marine boiler design was the substitution of tubes for the flat flues of the box boilers. Boilers fitted with fire tubes had been used in locomotive practice since the successful trials of George Stephenson’s famous “Rocket” in 1829. The use of tubes for marine boilers was urged by Thomas Cochrane, tenth Earl of Dundonald, who was born in 1775 and died in 1866. The Earl of Dundonald did much to assist the introduction of steam power in the Navy, and he designed HMS Janus, launched in 1844. This warship was equipped with four boilers, each containing three furnaces. A fine sectional model of one of these boilers may be seen in the Science Museum at South Kensington. The illustration on this page of this model, compared with the other illustrations, gives an excellent impression of marine boiler practice during the past century. In the boilers of HMS Janus the three furnaces sloped downwards to a common combustion chamber, and from the top part of this compartment a number of tubes was taken through the water space to a smokebox at the front of the boiler. From the smokebox the furnace gases were led to the funnel through a casing or “uptake” passing through the steam space in the boiler. AN EARLY VERTICAL BOILER was patented in 1881 by G. Kingdon. The type is suitable for high-speed engines up to 80 horse-power and has been extensively used for the supply of steam to auxiliary machinery. The Kingdon boiler has a large diameter in proportion to its height. The large steam space gives dry steam and the large grate area makes forced draught unnecessary. This practice was later abandoned as it was found that the plates of such uptakes were subject to rapid deterioration. Subsequently the uptakes were placed outside the boiler fronts. Adjacent flat surfaces were supported by stays, as in the “box” type of boiler with flat flues. “Reverse” valves were fitted to admit air on the formation of a partial vacuum. Other features of these boilers included float-controlled valves that automatically maintained the water level, and safety valves with weights hanging inside the boiler The safety valves were provided with external levers that enabled them to be eased from their seatings when necessary. Experiments were carried out by the Earl of Dundonald in the introduction of hot air into the combustion chambers of his boilers. Box boilers with combustion chambers and fire tubes were in common use in the Royal Navy after 1850 and came into extensive use in the Merchant Service about ten years later. The steam pressure carried in these rectangular boilers was usually about 25 lb to the square inch. The next development in marine boiler practice is linked with the demand that arose for higher pressures after the general intro-duction of surface condensers about 1860 and the adoption of two-stage expansion in marine engine working. Boiler pressures were raised to such an extent that it was unsafe to use flat-sided box boilers and it became necessary to employ cylindrical shells and flues with the usual fire tubes. The transition from the “box” type of boiler to the cylindrical type was not immediate, and between 1862 and 1886 numbers of marine boilers were patented that contained features common to either type. Among such boilers was that patented by W. Hawthorn in 1868. The shell of this boiler was semicircular at the top and bottom and its sides were flat. There were two oval furnace flues and one oval flue in the centre. The flatter sides of the flues were stayed together. Below the oval flues were three flues of circular section. The front ends of the two outer circular flues were led into an uptake to the funnel. The front ends of the central flues (upper and lower) were joined together. The flues and chambers in the boiler were provided with transverse water tubes that served as strengthening stays and improved the water circulation, in addition to providing additional heating surface. The flames and gases from the furnace flues passed to a combustion chamber at the back of the boiler, then returned through the central oval flue to the front, back through the central circular flue and finally to the front uptakes through the two outer circular flues. Two boilers of this type, 11 feet long, 9 feet wide and 11 ft 3-in high, were fitted in the steamship Mercury in 1869. They supplied steam at 45 lb per square inch to compound engines indicating 434 horse-power. The combined heating surface of the two boilers was 1,320 square feet and their weight 25½ tons. Two important improvements in marine boilers were incorporated in the design patented by W. Gray in 1872. These comprised the means adopted for superheating the steam and for heating the feed water. A boiler of this type consisted of a main cylindrical shell, about 20 feet long and 8 ft 6-in in diameter. It contained a large number of horizontal tubes connecting a smokebox at either end with a central combustion chamber. The boiler was double-ended and was fired from either end. The grates were placed beneath the shell. The furnace gases, therefore, passed along the under sides of the boiler shell and entered the central combustion chamber, from which they were drawn through the tubes into the smokeboxes. Above the boiler was placed a long steel drum connected to the shell by a number of vertical pipes. This steam drum and the vertical pipes were covered by a saddle-shaped water tank resting on the boiler shell with a flue between. The smokebox gases passed along this flue to the funnel, superheating the steam in the drum and heating the water in the saddle tank. Another interesting type of boiler was introduced by Howard and Bousefield during 1869 and 1874. In this boiler the single large shell gave place to a number of small drums, each with a diameter of about 42-in. There were three bottom drums, each containing a furnace flue; above these were three drums containing return tubes, surmounted in turn by three more drums serving as water and steam containers. A transverse drum joined the three steam drums at the top of the boiler. In 1877 two important devices were invented for use in boilers. One was S. Fox’s corrugated furnace flue, the other the shell expansion ring patented by G. Hepburn. A circular furnace flue offers great resistance to external pressure so long as it remains truly circular. Should local flattening occur, however, there is a “broken-arch” effect at that place, the flattening rapidly extends and the flue collapses. The Fox corrugated construction overcomes this difficulty by strengthening the flue, and in addition it gives greater heating surface and provides for longitudinal expansion. For marine boilers the corrugated flue has been the type most extensively used. Early experiments carried out to test the relative strengths of the corrugated flue and of the plain furnace tube showed that the improved form was able to withstand an external hydraulic pressure of 1,020 lb a square inch compared with 225 lb on the unstiffened flue. 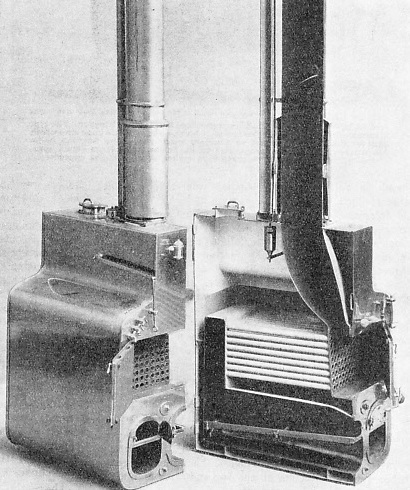 The Hepburn hoop was introduced into the boiler shell to counteract, by its own elasticity, the stresses due to unequal expansion and contraction of the top and bottom portions of the boiler. Vertical boilers have played their part in steam generation for marine purposes and are still used, although their function now is usually to supply steam to the winches, capstans and auxiliary machinery in cargo vessels. An interesting type is the Cochran boiler, modified for marine use from a land boiler patented in 1878. 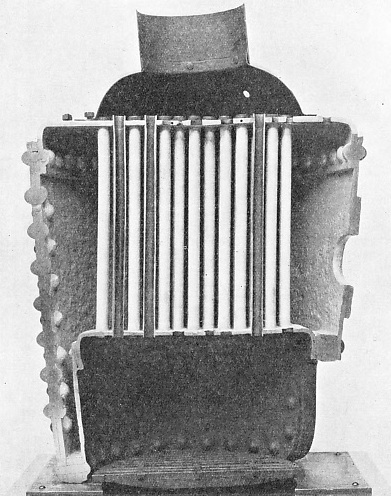 The vertical shell was fitted with a domed top that served as a steam drum, and the bottom was half-domed. The fire grates were contained in two short horizontal furnace flues that led to a combustion chamber inside the back wall of the boiler shell, to which it was secured by screwed stays, leaving a water space between. A type of boiler that closely followed railway locomotive practice and carried a pressure of 120 to 180 lb was at one time used in fast launches and torpedo craft. With horizontal cylindrical shells, these boilers comprised a rectangular water-enclosed firebox at one end linked by a number of fire tubes with a smokebox at the other end. The use of surface condensers made it impossible to employ the exhaust blast up the funnel to provide the necessary draught for the fire. This difficulty was overcome by the use of “induced” or “forced” draught. Where “induced” draught is used the furnace gases are drawn from the smokebox and driven up the funnel by a steam - or electrically - driven rotary fan. With the “forced” draught method the stokehold, or sometimes only the ashpit, is rendered air-tight and the air necessary for combustion is forced in by a fan. Forced draught was introduced in the Royal Navy about 1880 for torpedo vessels and is now used in all warships and to a considerable extent in vessels of the Mercantile Marine. Chief among cylindrical boilers is the famous “Scotch” boiler, introduced in 1862. These boilers and the further development of marine boilers will be described in the next chapter. THE BURST BOILER of H.M.S. Thunderer, a twin-screw armoured turret ship built during the period 1872-76. Just before the vessel’s official trials, the boiler burst. The cause was the failure of a safety valve because of unequal pressure. The design of the boiler was interesting. Four furnaces led to the combustion chamber at the back of the boiler.